This thread is for all issues and problems with Technical Readout: Succession Wars. There is no compiled errata for this product at this time. 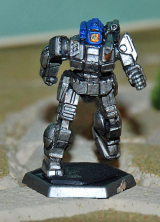 "Attached to House Davion’s Capellan March Militia, ... McPhearson is respected and well-known throughout the Free Worlds League for his fighting skill in the small ‘Mech." Need to assign him to one House or the other. Fix: Remove the entire editor's note. P. 146: Awesome, third column under heading "Lieutenant Giles “The Bangers” Barners:"
"Barners is considered the ace Awesome MechWarrior of House Kurita with seventy-one confirmed ’Mech kills. Barners’ lance of black-painted Awesomes formed the backbone and fist of Brion’s Legion’s Wernke Battalion." The rest of the graf treats Barners as a member of Brion's Legion, which is assumedly his unit. But that sentence could be confusing, unless the reader knows that Brion's Legion was employed by the Combine during the last years of the Third Succession War. 2. Amend the paragraph to make Barners' relationship with House Kurita clearer. PPC listed in right arms, art and record sheet show RT. torso. fix move to RT torso. Page 110, 2nd column, paragraph under the "Deployment" header"
Issue: Paragraph begins with the following sentence: "On Al Na’ir, a level II consisting of a trio of Lancelots was credited with disposing of a lance of Atlases that had so far successfully defended the system’s major production facility." "Consisting" implies that the Level II is exclusively composed of the three Lancelots. Later sentences in the paragraph reveal that the Level II is close to or at the full strength of six 'mechs. Fix: Change "consisting of" to "including"
Solution: This is a bit tricky as there isn't technically space to add it (shrink the font?). I'll leave that up to the person making the big bucks in layout. * THE ERROR: "Understanding the future of the League, of course, requires studying the past to prevent errors and tragedies from being repeating." * THE CORRECTION: "Understanding the future of the League, of course, requires studying the past to prevent errors and tragedies from being repeated." THE ERROR: "Numerous variants followed, including the short-lived, extremely-fast 15-ton FLE-14, relegated it to the scrapheap of history due to its paper thin armor." THE CORRECTION: "Numerous variants followed, including the short-lived, extremely fast 15-ton FLE-14, relegated to the scrapheap of history due to its paper thin armor." Assassin has 80 pts of armor (5 tons standard plate) assigned, but is only supposed to have 72 pts (4.5 tons standard plate). Correction: Change leg armor from 10 pts each to 6 pts each to match original TRO 3025. Several references to "Battle-Mech". Replace with "BattleMech". Curiously, the Draconis Combine has also begun fielding new Bombardier variants. Bombardier needs to be italicized. Page 128, Cataphract: Two instances of 'Mech name not italicized when it should be. ...enhance the ’Mech’s defensive potential at a significant weight saving. ...enhance the ’Mech’s defensive potential at a significant weight savings.